The pregnant body goes through miraculous changes to support the even more miraculous human being growing inside of the womb. One of those changes is in the respiratory system. In addition to these system changes, are the physical changes happening within the torso. As the uterus expands upward, the diaphragm is pushed upward (along with the other organs in the way such as the stomach and colon) and the ribcage expands. 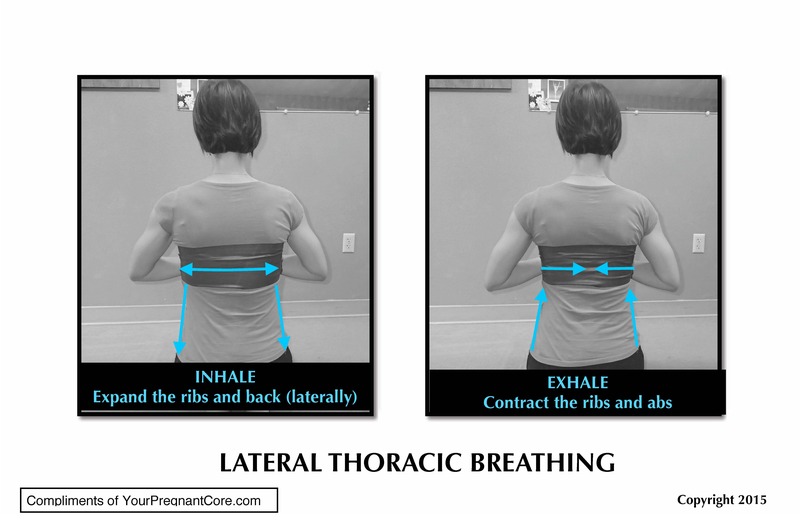 This is why Lateral Thoracic Breathing is beneficial, allowing for efficiency of breath. First we want to make sure that mom-to-be has her ribs lined up properly with the pelvis-that she is not thrusting, or pushing the bottom ribs out, which is more common during pregnancy. To fix thrusting ribs, close the ribs down, as we cue in Pilates. Now we are ready to breath. -to create space in your torso for your growing baby by lengthening your spine and stretching the ribcage. -to relieve stress by calming the nervous system. Thank you for taking the time to read Your Pregnant Core! Please take a moment to fill out the contact form below!